Budds' Chev | Blog | The 2019 Colorado ZR2 Bison: We don’t need no stinkin’ roads! The 2019 Colorado ZR2 Bison: We don’t need no stinkin’ roads! Does off-roading mean more to you than putting two wheels on the sidewalk? If so you might be interested in the Bison edition of the Chevy Colorado ZR2 pickup. This is a mid-size pickup engineered for the most rugged trails. Trust us at Budds’ when we say… Forget heading out to the cabin for the weekend. This will take you places as wild and remote as you want to be. Pickup trucks come in three sizes. You’ve got Heavy Duty pickups, like the Silverado 2500. These are big, serious trucks for doing serious work. Then you’ve got full-size pickups, like the Silverado 1500. This is still a lot of truck. It’s great for taking the crew out to the job site, but some people find it more truck than they need. That’s where the Colorado comes in. It’s smaller than the Silverado, though not by much. You can get it with an extended cab or a crew cab and a 1.575m box or a 1.88m box. It’s also available with either 2WD or 4WD. In Z71 trim the Colorado comes equipped to work off-road. To this end, standard equipment includes the off-road suspension package, 17” all-terrain tires on dark alloys and an automatic locking rear differential. There’s also an “EZ lift & lower” tailgate and hill descent control plus, at the front, recovery hooks and fog lamps. Inside you get powered and heated seats, so you’ll be sitting comfortably while tackling the trail. Stepping up to ZR2 trim reaps enhanced off-road capabilities. To start with, it gets a 50mm suspension lift and the front and rear tracks are widened by some 90mm. The 3.6 liter is standard and it’s paired with an eight-speed automatic so you’ll always have all the power and torque you need. Also standard: 4WD with a two-speed transfer case and locking front and rear differentials. In other words, you’ve no excuse for getting stuck anywhere! There are also special Multimatic® Dynamic Suspension Spool Valve Shocks for superior response on rough terrain. If trailering is your thing, the ZR2 comes with the trailering package as standard and a trailer brake controller. 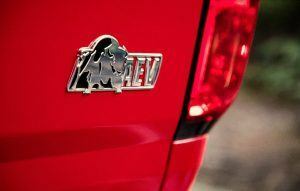 The Bison grew out of a collaboration between Chevrolet and American Expedition Vehicles (AEV). AEV is a company specializing in accessories for off-road driving and overland travel. If you’re planning on crossing the Sahara or driving down to Patagonia, they’re the people you go call for help in toughening-up your 4×4. Off-roading takes many forms, from parking in a muddy field for a sports event to hauling gear deep into the wilderness. If your version of off-roading is a little time driving on unpaved roads, the Z71 might suit you very well. But for more advanced work—perhaps you’re on a ranch and need to tackle some trails on occasion—consider the ZR2. Only if your idea of a good time is getting far away from civilization do you need the ZR2 Bison. If you want extreme off-road capabilities, there’s no doubt this is the truck to buy.